Stories and Archives : R: The more that we get involved and help each other, the better this earth will become. R: The more that we get involved and help each other, the better this earth will become. “I've learned that people will forget what you said, people will forget what you did, but people will never forget how you made them feel.” -Maya Angelou My favorite holiday till this day is Christmas, because I love the feeling of waking up in the morning and running to my Christmas tree and finding all my presents under the tree. The feeling that I would get unwrapping all my presents one by one was unforgettable. The feeling that I get opening my Christmas gifts makes me want to spread this joy to others. That is why I am hiring myself for the veterans gift drive. I want to give back to the veterans for all the hard work and protection they have done for this country. I want them to feel the joy that I feel every Christmas morning when I receive presents for Christmas. They deserve gifts on Christmas and much more. This is my way of spreading my joy to veterans and also giving them thanks for everything they have done for this country. 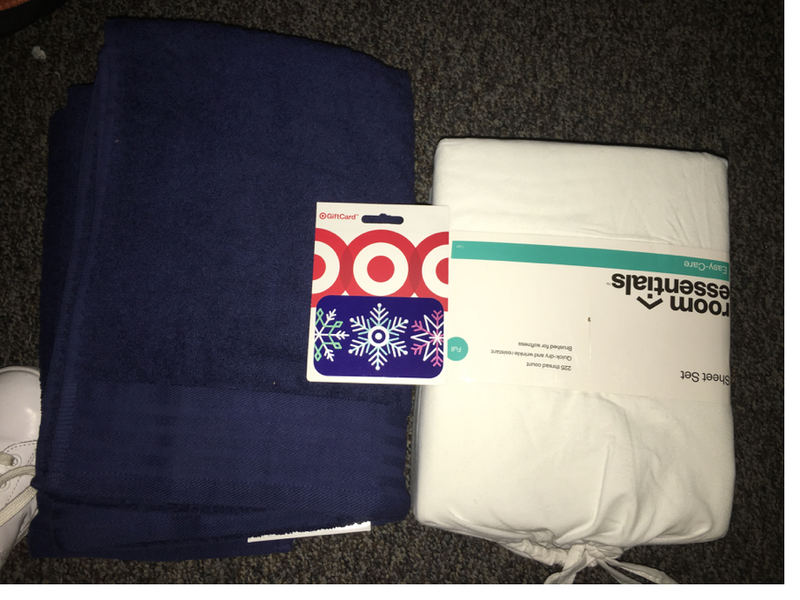 For my service project I drove to Target and bought two large bath towels, a sheet set (size full), and a target gift card. I’m hoping the veterans from Veteran’s Village will receive these items and really enjoy them. I want them to feel the happiness that I feel every Christmas morning. I wish that I could be there giving out all the gifts, so I can see their reactions, but I am going to be out of town, sadly. Buying these gifts for the veterans really connects to my core values, because I love to give back to those that have given so much to me. What these veterans do for our country is incredible and everyone should appreciate them greatly. Sometimes I feel like they are forgotten and not given enough hospitality. The fact that the veterans risk their lives in order to save ours is just amazing. This service project relates to my major because in this project I was doing service for others. For my major, accounting, I will always be doing service for others except this time I will be getting paid. I believe that the veterans will love these gifts. They will be so happy waking up Christmas morning and seeing that there’s people in this world that care for them and appreciate them. I don’t even think that they will care too much about the size of the pajamas, or about how big or small the blanket is, I think that they will just be focused on the thought that counts. I think they will be enjoying all the people surrounding them with joy giving out the presents and all the people that bought them the presents. The gifts and veterans village holiday party will definitely put a smile on everyone’s face, especially from the veterans. The people that are giving out the gifts are going to feel so full and happy inside that they might want to keep doing it every year maybe. Maybe other people or organizations will see what we are doing for the veterans and they will feel so impacted that maybe others will start doing something similar to this service project. The more that we get involved and help each other, the better this earth will become. I loved doing this service project because it makes me feel like I’m putting a smile on someone’s face. Even though I cant physically see it. I know that I’m helping out a veteran and that they’re feeling appreciated by me. I hope to do this each Christmas or maybe do something similar to this during the year. Giving back to others makes me the happiest.